Two-seat bench with embossed lacquered MDF frame and aluminum legs, upholstered in leather, faux leather, fabric or customers fabric. Fully removable cover version available upon request with a surcharge. ... is available in a wide range of fabrics, leathers and finishes to complement its new aluminum base system. Available in a bench, armchair and sofa, Steeve can be created in countless configurations to enhance any interior space. THE SAME X-SHAPED LEGS FOR THE STOOLS FEATURE QUILTED LEATHER OR FABRIC UPHOLSTERY. IN TWO SIZES, THEY CAN BE MATCHED TO THE DINING TABLES OR BE USED AS ADDITIONAL SEATS OR TABLETOPS IN THE LIVING ROOM AND IN THE BEDROOM. THE DORMEUSE FOR MID-ROOM PLACEMENT AND THE SQUARE OTTOMAN ARE ELEMENTS THAT GO WITH SEVERAL SOFAS AND ARMCHAIRS OF THE APTA COLLECTION THANKS TO A DETAIL PRESENT ON MANY OF THE ITEMS: THE NICKEL OR BRONZE VARNISHED STEEL TRIM . Standing on an elegant chromed metal base, Style is comfortable and wrapping and suits any room of the house. ... totally removable whether they are fabric or leather. Large integrates the traditional elements with a series of components (bench, corner armchair and small tables) that add a distinguishing and original touch to the project. 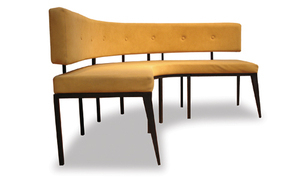 An armless banquette bench with an upright high back. Extra customization can be obtained by using other choices of fabrics. A contemporary upholstered bench is a seat for one or more people which is normally padded, covered in fabric and supported by legs. It may integrate certain elements of traditional or period designs but demonstrates originality by using current technology, materials, forms or colors. Such a bench can be a unique piece or part of a set of living room furniture. It may have multiple functions, including integrated storage or shelving. Many designs are suitable for exterior and commercial spaces (e.g., restaurants, cafés or outdoor terraces). This furniture is often upholstered in low-maintenance and weather-resistant fabrics, such as PVC. The cushioned seat and covers of a contemporary bench are often permanently fixed to the frame, but are sometimes removable for easy maintenance. The frame may be partially covered with a textile. The supporting frame can be made from many different materials, including stainless steel, plastic, MDF or veneered wood. Special techniques, such as plywood steam bending, may be used to create curved or complex forms . The dimensions, number of users, intended function and indoor versus outdoor placement are important points to consider. Factors to consider for commercial and exterior applications include durability, weather resistance, number required and the possibility of permanent installation.